I love Ikea! I love their simple designs, unique patterns and budget conscious prices. During a recent trip to the furniture mega store, I noticed that their baby collection was not only practical, but modern looking and easy to store. While looking around, I used my son as a tester, popping him into their cribs, highchairs and changetables. Even though he is a bit big for his age (9 months), he still seemed to fit into most of their pieces easily. I am especially fond of the SPOLING Change Table. It reminds me of the suitcase holder that is in the corner of every hotel room. 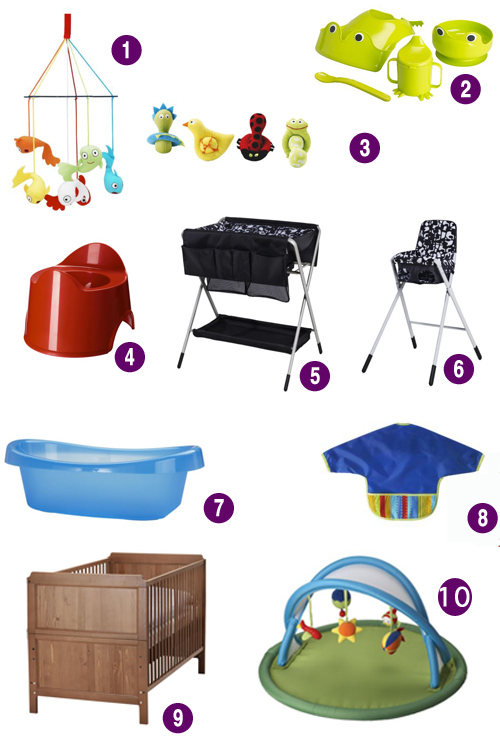 Because some of these products are priced well below their counterparts, you may find that they don’t have all of the bells and whistles, which is normally okay with most parents who are looking to stick within a certain budget. SPOLING changing table $79.99 – sturdy and compact. I like this hotel suitcase holder like setup. SPOLING highchair with safety belt $49.99 – This compact highchair doesn’t have a tray. It appears to have been made to slide right up to the table. Great for Grandmas. LEKSVIK crib $199.99 – The 2 height adjustable crib also will do double duty as a toddler bed.